Studying for the barrage of science finals and the MCAT, simultaneously, is a relatively independent enterprise. You can try to study in groups, you can attend the review classes, and you can go to the library to be around others, but in the end the process involves you and a lot of text. I tend to avoid the library around exam time, because entering the chemistry library around now is like waiting in line at the drugstore for a prescription during flu season: you’re afraid to get too close to anyone because everybody looks like hell. As an avid people-watcher, I’ve found that coffee shops are too distracting, so my go-to work site is the desk in my bedroom. And I am good at it. I can sit down and focus for hours on end, plugging away at physics or organic chemistry or whatever is on the table that day. When the weather is good, I throw open all of my windows and can’t focus. When the weather is bad, I feel sad and lonely. I draw cosmic parallels between my depressed mood and the rain, certain that even the weather gods are conspiring against me. In case you can’t tell, I get melodramatic. I have begun to entertain myself on short study breaks at night by shining my laser pointer at the dogs owned by a professor across the street. I love most dogs. I hate these two small, yippy rodents. They stand outside and bark at exactly one-and-a-half-second intervals for nine straight hours. Every night. So I shine my laser pointer over there, get them riled up chasing the red dot in circles, then run them into the side of the house over and over again. It never gets old. But by far, the most challenging situation I face daily is the struggle to put on pants in the morning. I wake up early, go through my morning workout/eat/shower routine, and then face the crucial decision: pajamas, or real clothes? Pajamas usually wins. With pajamas, I psychologically lock in to studying at home; pants leave the option to go out. Pajamas are my concession to the MCAT gods, a fashion libation that is supposed to say, “I’m here to do some WORK.” Pants leave the door open to being a real person and going out. Pajamas are the easy choice; I can pretend they’re a motivator, but really they’re just comfortable and allow me to behave like a fourteen-year-old hermit. I realized all this when I got dressed for a short study break to have dinner with some fellow postbacs recently. It had been four days since I had worn real clothes. Four days! And honestly, I can’t tell you how good it felt to get out of the apartment and be social – you know, like people are supposed to behave. So while I might have been a brutally efficient studier in my pajamas, my quality of life declined. 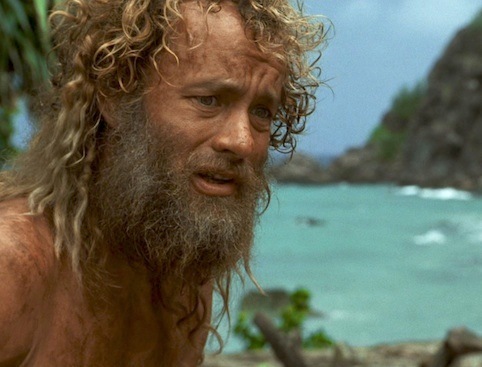 I got antsy over little things, paced my apartment when it rained or when I struggled with a problem, and started to look and act like Tom Hanks from Castaway. I never started talking to a volleyball, but that’s probably only because I have a cell phone and the Internet. I was lonely and sad, and going out even for thirty minutes with a few friends made all the difference. Really. So if you ever commit a felony and get thrown in the hole, or have to take the MCAT yourself – treasure your few moments in the yard. They’ll keep you sane. Frankly, not that far from the truth.